How to download your slider? After you have uploaded at least 3 pictures, the button appears. This leads you directly to the final product page where you will be able to do some further adjustments to the slider and also download the slideshow to your computer for further use. Just click onto the download disc on the right, directly below your slider. You'll receive a ZIP-file, including a folder with your scaled pictures called 123-slideshow and furthermore a file called "code.html". Just upload the folder with the pictures to your webspace and copy and paste the content of the code.html to HTML-code of your website. If your pathes are not correct, check them here. If you have HTML access to your file this should work absolutely problem free!!! The only thing that might happen is a wrong path to your pictures in case of intricate structures. 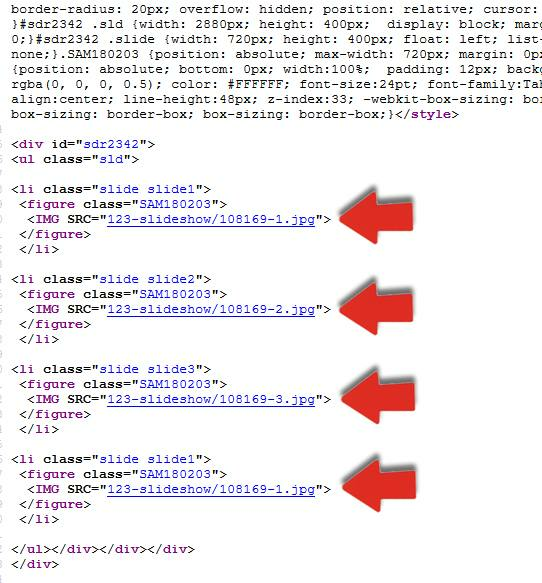 In case of non appearing pictures please check the paths in the HTML-code. This is very easy, just look at the picture with the 4 red arrows. Is there a way to change the font size for the text overlaying the images? Thank you. For some reason, when I put the slide show on my dreamweaver...it changed. there are 3 issues with it and I can't figure it out. 2. I have 4 slides, and each gets progressively smaller as they expand to fill the container. Almost as if it is showing a hierarchy or the slide order. Then the "snap" to fill the whole screen as the next slide transitions. 3. I think its related to issue number 2, but the progressively smaller slides allow a sliver of the previous slide to still show on the left during the current slide. This sliver gets bigger in width for each slide, until it resets back to slide 1. Slide 1 is perfect. but the width and height gets smaller and smaller for each slide. and as a result, the previous slide can still be seen (which gets bigger for each slide) If you send me an email address, I can send you a 20 second video of what I am talking about. Any help in fixing this would be much appreciated. More than 1 slider on website possible? Love the slideshow and especially the ability to set links for each slide. I do not know how it would be possible to have more than 1 slideshow on one page.....index.html, for instance. Each slideshow gets its code which isnt a problem, but the images are in a 123 Slideshow folder. Wouldnt one folder overwrite the other when uploading to the server? 💬 Answer from admin... Hello Harold, you can have as many sideshows as you want on one site. Yes, there is that folder called "123-slideshow_com" where all images get stored. Please put all pictures (off any slides how on your site) in that single folder. Does this work with host gator website builder? I tried pasting the code in it and the application seems to be working because I see things moving around but the pictures are not showing up. 💬 Answer from admin... Hi Drew, I don't know gator website builder. But since you see things moving around it seams to work but you didn't upload the folder (123-slideshow in the zip file) with your pictures to your webspace at gator. Am I right? Please upload that and make sure the path to the picture folder is correct. Than it will work!